When American DJ first came out with its X-Move LED, the innovative DMX moving head was hailed as a landmark dance club effect because it used a powerful white LED, in place of a halogen or discharge source, to shine through color and gobo wheels. The fixture’s high-power LED source created stunning patterns and colors, while using much less energy, running at a cooler temperature, and lasting much longer (50,000 hours) than conventional lamps. Now ADJ is continuing its LED revolution with the all-new X-Move LED Plus R, the next-generation version of this popular groundbreaking moving head. Offering all the amazing features and effects of its predecessor, the new X-Move LED Plus R is 30% brighter than the original, thanks to its cutting-edge 10W CREE white LED source, which incorporates the latest advances in LED technology. What’s more, the X-Move LED Plus R takes the term “revolution” quite literally, as another of its exciting new features is the addition of a “revolving” – or rotating – motion to its gobo images (the “Plus R”!). Just beam out its 6 replaceable rotating gobos on the walls, floor or ceiling, and they’ll rotate either fast or slow, clockwise or counter-clockwise – whatever you specify -- putting a new spin on the visual experience at clubs and discos! “The original X-Move LED was truly a technological breakthrough in lighting,” said Scott Davies, General Manager of the American DJ Group of Companies. “Early LED beams weren’t very powerful, so they couldn’t be used as a lamp source to project through color and gobo wheels. 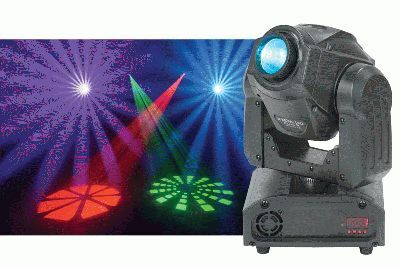 Then along came the X-Move LED with a beefed-up LED lamp that projected such bright colors and images, party goes couldn’t tell the difference between it and a conventional halogen or discharge moving head. Meanwhile, clubs and entertainment venues benefited from its LED technology, enjoying such advantages as low heat production, longer life and slashed energy costs. Along with its 6 rotating replaceable gobos, which measure 23.8mm with 0.2mm of thickness, the X-Move LED Plus R features 8 vibrant dichroic colors plus white. The colors and gobos are on separate wheels, so users can create a wide and varied range of combinations. Still more mind-bending light show possibilities are offered by a Gobo Scroll mode, Gobo Shake Effect, 0-100% Dimming, Manual Focus, and pulse effect that delivers a Random Strobe from slow to fast. High-quality stepper motors with microstepping, a 14° beam angle, and an impressive 540° pan and 270° tilt mean even the farthest point in the club will be covered with smooth-moving lighting effects. Not only does this visual marvel light up a dance floor, it’s simple to use, thanks to built-in lighting programs, which allow you to simply plug in the effect and watch it gyrate to the beat of the music in Sound Active Mode. The X-Move LED Plus R can be run in two other modes as well: DMX-512 (9 channel) and Master/Slave. A four-button menu navigation system with a bright LED display makes it easy to navigate through the fixture’s settings. For those who prefer to go “hands off,” the X-Move LED Plus R is also compatible with American DJ’s UC3 Series of easy-to-use remote controllers (sold separately). Another nifty feature is Auto X-Y repositioning, which allows the fixture to return to its position original position, no matter if it’s bumped or thumped. The X-Move LED Plus R is truly a cool customer -- when the action on the dance floor heats up, it never will. The effect can run all night long with no duty cycles, thanks to its LED technology. That means entertainers can pack up after a gig and leave in a flash, without needing any cooldown time. The LED source is rated at 50,000 hours, so you can say goodbye to the hassle and expense of lamp replacement, too. Power output is an infinitesimal 60W, which is just a tiny fraction of the electrical current required by a halogen lamp. Weighing a paltry 13 lbs/5.9 kgs., and measuring 8”L x 7.5” W x 12.5” H/ 205 x 190 x 320mm, the X-Move LED is easy to transport and can sneak into even the most snug nooks and crannies. It features a switchable voltage of 115V/60Hz or 230V/50Hz IEC socket. The unit will fit into the Arriba Cases AC-115 padded soft case, which will protect it during transport and keep it clean in storage. The MSRP of the X-Move LED Plus R is $839.95.